In 2009 Duncan Jones announced himself in the filmmaking world with the superb science-fiction character drama Moon. 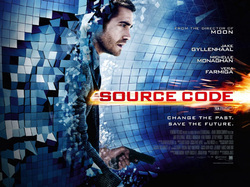 Now in 2011 he releases his follow up and it is once again a science-fiction character drama named Source Code. The plot of Source Code focuses on Colter Stevens (Jake Gyllenhaal), an air force pilot who awakes on a train he has never been on, with people he has never seen and inside a body that is not his. After eight minutes the train explodes and he awakens in a chamber being watched by Goodwin (Vera Farmiga). He is then informed that he is inside a computer program called the Source Code, which enables him to cross over into another man’s identity for the last eight minutes of his life with the mission to find out who the bomber is in order to prevent a second, larger attack. While Duncan Jones did not write Source Code it is obvious why he chose to make this film as it shares many similarities with Moon in terms of character and themes, making it an odd sister piece. Moon and Source Code are both about men who are slaves to powers above them and whose humanity and rights are being violated for the purpose of a singular mission. Both films have a large degree of moral ambiguity regarding the actions of corporations and how they treat people in order to reach their goals, while their subjects struggle to take true control of their lives. Source Code is a much more mainstream film than Moon and people going in with expectations that the film will equal Moon will only be left disappointed. Like Moon, Source Code plays with a lot of science fiction ideas that have been explored in numerous other films however similarly to Moon despite the fact that it is not breaking new ground in the sci-fi genre it is exploring these ideas better than most that try to. While Source Code may not be as good as Moon, it is the best film of the year so far and is an exciting, gripping and intelligent sci-fi flick. Much credit must be given to Duncan Jones for being able to make the film as exciting and gripping as essentially for most of the films running time we are replaying the same 8 minutes again and again. This is a plot device, which could have been tedious and repetitious however each time we revisit the eight minutes there is a new focus both In terms of how Colter Stevens acts and how the minutes are presented visually. Jones does not waste the larger budget he has deservedly been handed and there is only one main set piece to the film, which is an explosion, repeated again and again and again. Each explosion has its own visual identity and in one scene Jones slows it down as we see the flames build up towards a frozen Stevens and Christina staring in to each others eyes, perhaps my favourite shot of the year so far. Another long shot that revolves around Colter Stevens jumping off a train is similar to the Eric Bana fight scene in Hanna in how to effectively utilize a long shot to build tension rather than to be flashy. Fans of Jones and Moon will also note the use of a particular Chesney Hawke hit something that will be being looked for in all of his future films. If Duncan Jones can continue making films In the vein of Moon and Source Code getting more money and exposure with each one then he could indeed as many are saying be the new Christopher Nolan. However he is yet to make a Memento or Inception but the potential is there. Source Code is much more of an ensemble piece than Moon, however almost every film is an ensemble piece compared to Moon. The performances across the board in Source Code are great with Gyllenhaal giving one of my favourite performances of his career as he carries the film with a great deal of charm and humour while also pulling off the films more dramatic and emotional moments. Michelle Monaghan is also good in her role, as she has to essentially repeat the same performance each time we revisit the eight minutes not having the same freedom as Gyllenhaal who does a different thing each time. Jeffrey Wright and Vera Farmiga are great in their supporting roles, with Wright in particular superbly pulling off the pantomime esque morally ambiguous scientist. What makes Source Code so engaging is the fact that it deals with interesting sci-fi concepts, has a mystery at the centre of it, raises interesting moral questions and leaves a great amount open for discussion for all the science fiction enthusiasts out there. It is a science fiction film that, like The Adjustment Bureau and Limitless has concepts and character at its core rather than constant fight scenes and explosions. While many may find the ending of Source Code equally disappointing as the endings to those two films, I find the ending to Source Code to be less disappointing than those others as unlike The Adjustment Bureau it is not predictable and unlike Limitless it does not destroy the message of the rest of the film. The film keeps you thinking throughout its entire running time however if you over think the film you may find certain elements either not stand up upon further observation or lead to confusion in the field of quantum psychics and alternate realities. Ultimately Source Code is an engaging, exciting, well-made and well-acted film that despite its minor flaws and divisive ending stands tall as the best film I have seen so far this year. It is an intelligent film that puts engaging concepts, themes, social commentary and characters at the centre of its tale and rattles along at a good pace and length, keeping you thinking for its entirety. It may be more mainstream and ultimately less brave than Moon but as a Hollywood backed science fiction film this is almost as unpredictable and interesting as they get.